Looking for something fun to do over the holiday break? Get in the spirit at the fifth annual Detroit Public School League Holiday Hoops Classic Thursday and Friday Dec. 26 and 27 at Cass Tech High School, featuring 10 high school basketball games over two festive days! Fans and families can feast on four boys’ games and one girls’ game each day as stellar teams from the area as well as powerhouses from as far away as Toronto and Chicago are showcased. Admission is $10 for an all-day ticket that can be purchased at the door. The Detroit News had five PSL teams in its preseason Top 20 state boys’ basketball rankings. No. 1-ranked Pershing, Cass Tech (No. 5), Douglass (No. 6), Southeastern (No. 10), East English Village (No. 20), along with “teams to watch” from King and Western, will all take the floor in the two-day event. Likewise, the girls’ action will feature two of the state’s top teams in King and Cass Tech, ranked No. 2 and No. 17 respectively, in the Detroit Free Press girls’ basketball top 20. Among the anticipated games, defending PSL boys’ champion Pershing, led by Mr. Basketball candidate Justin Tillman (VCU), will play top 10-ranked Southfield at 7 p.m. Thursday. King, the defending PSL girls’ champion led by the highly-touted senior tandem of Marte’ Grays (DePaul) and Lashai Geeter (Stetson), will play Chicago-area power Crete-Monee at 3 p.m. Friday. The action kicks off Thursday with Douglass, featuring another Mr. Basketball candidate in senior Darrell Davis (Dayton), tipping off against Harper Woods at 11 a.m. The remainder of Thursday’s schedule: King vs. Ferndale 1 p.m.; Cass Tech vs. Oak Park (girls) 3 p.m.; Western vs. Clarkston 5 p.m.; Pershing vs. Southfield 7 p.m.
Friday’s schedule: Ford vs. Grosse Pointe North 11 a.m.; East English Village vs. Community 1 p.m; King vs. Chicago Crete-Monee (girls) 3 p.m.; Southeastern vs. Mumford 5 p.m.; and Cass Tech vs. Toronto Eastern Commerce 7 p.m. 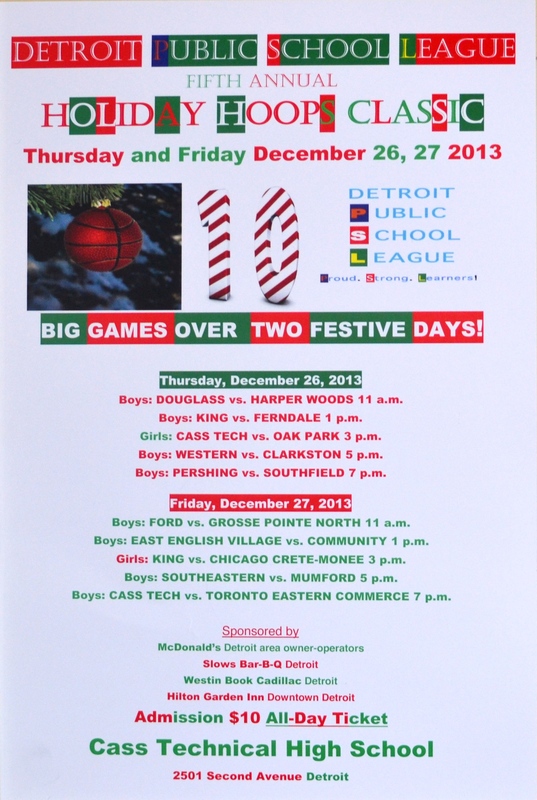 Fans and families are encouraged to warm up to the holiday spirit and watch the high school basketball season heat up at the fifth annual Detroit Public School League Holiday Hoops Classic Thursday and Friday Dec. 26-27 at Cass Technical High School. See you there!